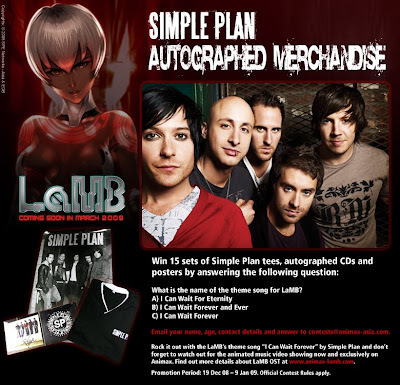 My Favorite Band, Simple Plan have just rock the world again with new LamB's Theme song "I Can Wait forever" and now you can even win some prize from animax-asia since the dateline is 9 Jan 09. Here is the OST from youtube below this post! Enjoy and leave some comment and feedback about it! Personal Note: this OST really rock!